Natch. Or ‘Natch. Slang for ‘naturally’. I (Adam) was asked to write a piece about our steel. In beginning this process, like most things I endeavor, I started out doing some research. I wanted to look at what we have said already and see if I could add clarity or depth to what has already been stated about Surly Natch tubing. Turns out the intro from the 2014 catalog [a piece I co-authored with Tyler] does an excellent job of covering most of the important details. Some of the models referenced are sadly discontinued. But the general message is spot on. Essentially, what is trying to be addressed above, is the question “Is Natch just 4130 Chromoly?” Yes. Well. Technically we use SCM430, an Asian equivalent to 4130. Because our bikes are proudly produced in Taiwan. In case you were not aware, a large percentage of quality bikes are produced in Taiwan. There are many Taiwan based manufactures who excel at mid to high quality small batch production. This aligns nicely with our goals to produce durable goods at a reasonable price. Additionally, Taiwan has modern labor laws, as well as environmental regulations. With most of the bike industry centered in Taiwan, it also allows us to consolidate our assembly, and gives us a nice launch point for global distribution. But yes, and so much more. Natch is our philosophy on how thick/thin we make our tubes during the butting process, how long or short the butts themselves are, as well as the length of the transition (from thick to thin}. Natch includes our welding process. Our approach to mitering the tubing, how it’s fixtured and welded. Natch is also the ride. Ride quality is important. A bike should be stiff enough to react well when you push down on the pedals or lean to incite a turn. A bike should also be comfortable enough for an all day, week, month or even longer ride that it won’t beat you up. When we set off designing a bike, we look at each size individually, ensuring that the right tubes are used in each size bike, as that model is intended to be used. We intentionally build ride characteristics into each size. Working with chromoly steel affords us the flexibility we need. Our philosophy also dictates that a bike should not be so heavy that it’s a burden to ride. Butted steel lets us maintain reasonable weights while balancing other considerations. A good bike should also be affordable. Using chromoly steel lets us manage cost. Our bikes are intended to be durable and versatile. We design our frames and forks to last a very long time, and to be versatile enough that if you decide to go touring on your Karate Monkey or take that dirt road home on your Straggler, you and your bike will be well suited for whatever may come. Natch is that reassurance that even if you misuse your Surly bike a bit, you’ll be ok. “Derby Rated” as we used to say. Stack it up in the bike pile. Toss it in the back of a truck in the Outback. It will be fine. Chromoly steel enables all of this. So yeah. 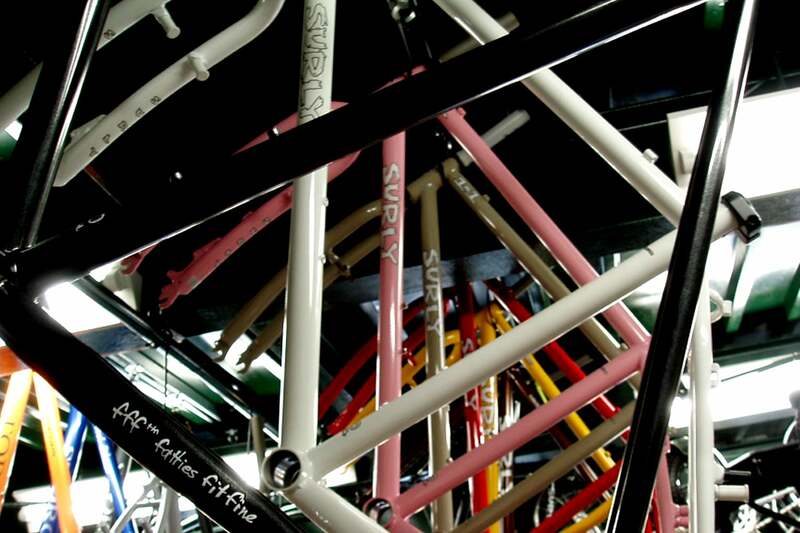 Surly bikes are made with 4130* tubing. Naturally of course. Further reading and my references for this article.